Repair Dynasty Gas Grills and Jenn Air BBQ Grills By Replacing Burners With Cast Iron or Stainless Steel H Burner. Dynasty gas barbecue grill models were among some of the best BBQ grill models of their time. Even though today Jade no longer exists and Dynasty grills, appliances and parts no longer exist there are other barbecue manufacturers who fabricate the cast iron burners, stainless steel burners, valves, radiant briquette heat shields and other replacement parts to keep repairing Dynast barbecue models. 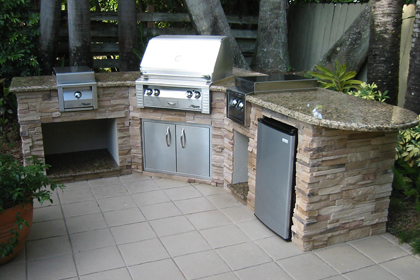 Many of these incredible Dynast barbecue grills were built in to custom outdoor kitchen islands that are made to last as long as the home where they are built as an outdoor kitchen. Instead of replacing an American made 304 stainless barbecue grill Dynasty gas grills should be repaired because they are going to last a very long time with minimal problems if treated halfway decent. Original cast iron barbecue grill burner for Dynasty gas grills. See Dynasty Grill Repair Parts. At the time Dynasty gas grills were being manufactured most gas grill companies using high-end 304 stainless steel were also still using a lot of cast iron. Cast iron is one of the best heat conductors and heat distributors on our planet and is a great metal material for burners and cooking grates in barbecues that build up conductive and convectional heat. 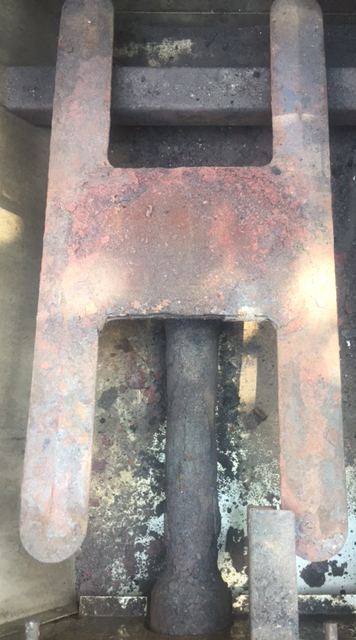 The only problem can be if the parts are not de-greased enough because cast iron has a lot of iron-oxide which in turn oxidizes which is a fancy word for rust. Dynasty control valve do not line up with burner connections but have a stainless gas line to link valves to orifices to burner. When the burner is installed the venturi tube slides over the gas orifice. While most barbecue grill models position the control valve so the orifice slides into the burner the Dynasty design seems somewhat arbitrary. If the valves were positioned a few inches left or right the controls would feed into the burner. What is nice about these offset valves in that common grease fires that ruin DCS and Alfresco and other gas grill valves cannot easily damage the Dynasty control valves because of this offset design. Also the elbow fitting that connects the orifice can be easily loosened in place which makes the H burners very simple to install without using tools. 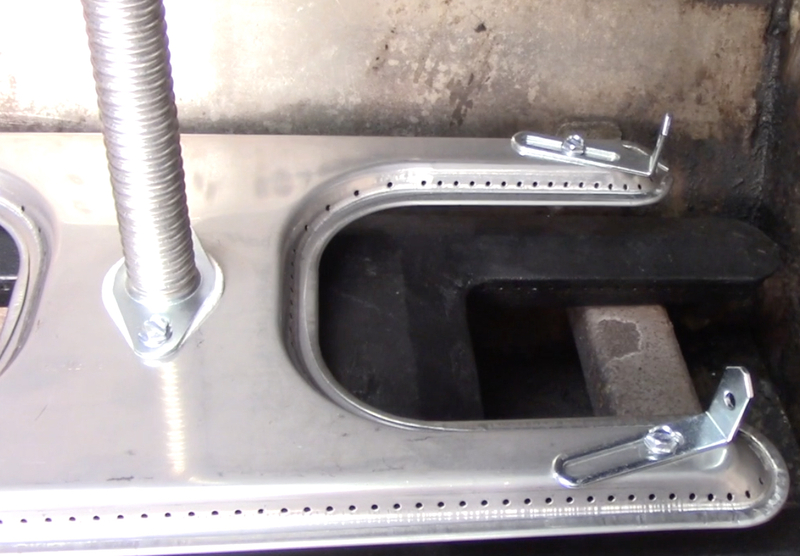 When we choose to adapt a stainless steel H burner to fit eh Dynasty we can easily install clips to the corners of the H shaped burner so the repair is complete once the orifice slides into the H burner venturi tube and the adjustable clips drop into the back support beam. 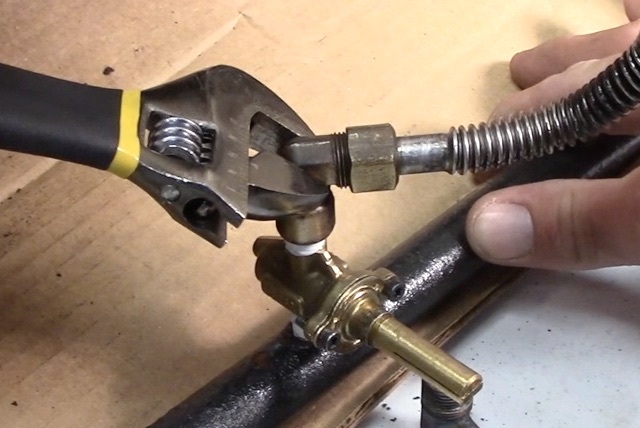 Dynasty control valves thread into manifold pipe and attach to corrugated gas hose to connect burner just like other bbq models connect a rotisserie but these valevs connect the main burners in this manner. When threading any valve into any manifold pipe Always use a pipe wrench so the stem is not stressed. As you could guess the small ball-valve inside a barbecue grill control valve can be damaged easily. Use putty or teflon to seal the threads and a pipe wrench to install the valve into the threading so the valve is not harmed and is tightly connected to the gas manifold. The stainless steel corrgated gas line attaches the control valve to the elbow with the gas orifices to feed LP or NG to these Dynasty burners. Install stainless steel H burner into Dynasty gas bbq grill. Once the cast iron or stainless steel H burner is installed and clipped level in the back of the fire box, always remember to adjust the air shutter. At the end of every gas burner venturi tube is an adjustable air shutter which is essentially a carburetor. Adjust the flow of fuel mixing with oxygen into the Dynasty H burner for best results. Also inside the control valve stem is a adjustment for the ball valve itself which can be used to adjust the control movement for more or less gas flow. Previous post: Replace Control Valve Igniter In Emperor, Olde Native, Imperial Barbecue Brands. 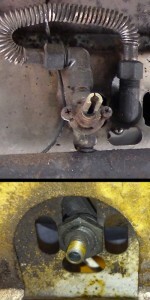 Next post: Replace OCI U Burner To Repair E36 and E48 BBQ Grill Models.